The namesake of the Verragio brand, Barry Verragio, spent over 25 years getting to know the industry, learning both craftsmanship and a commitment to quality at the feet of some of the most talented designers in the world. Starting as an apprentice, Barry worked his way up to studying at the Fashion Institute of Technology in New York City. Today, Verragio is synonymous with luxury bridal jewelry, novel designs, and an adherence to gorgeous Old-World traditions. We at Thom Duma Fine Jewelers are proud to be an authorized retailer for Verragio, and we’re confident our customers will treasure this brand as much as we do. One of the most popular Verragio collections of engagement rings we offer at TDFJ is the Venetian collection. Named for the long history of Italian elegance that the Venetians have perfected over centuries, this collection’s rings have a tiara of diamond-studded gold so delicate that it lets nearly 100 percent of sunlight through its scrollwork or the brilliant stones. Also, the Insignia collection is very popular thanks to its engagement rings being patterned after the regal elegance of the Verragio logo! Ideal for the woman who likes a ring to have very prominent scrollwork and profile beading, the Insignia collection comes in the three shades of 14k gold that Verragio embraces in all its rings. 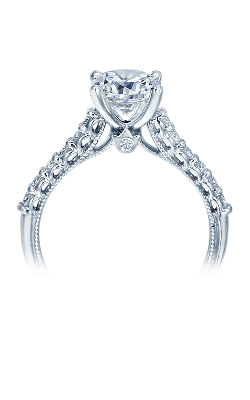 If you’re really in love with the Verragio “make it yours” style, don’t overlook the Parisian collection. With the most options for customizing the metal tone out of all the Verragio collections (including the halo, scroll, shank, and beading), you can truly make a unique engagement ring that speaks to your special aesthetic with the Parisian collection. And don’t miss Verragio’s wedding band collections! With bands for her and for him, Verragio is ready to make your special day even more special thanks to the two-tone, neoclassical traditions that Verragio imbues in each of its pieces. Why Shop for Verragio at Thom Duma Fine Jewelers? Founded in 1896 as Klivan's Jewelers and later being renamed in 2002 as Thom Duma Fine Jewelers, our company is built on 123 years of excellence, trust, and expertise in the world of jewelry. The Verragio brand is one of the most magnificent brands we offer to the customers of Warren, Ohio, but we also showcase other brands that have the same atelier cachet, including brands that focus specifically on bridal jewelry, ones that design fashion jewelry, Swiss-quality timepiece brands, and GIA-certified diamonds. If you’re interested in finding out more about our jewelry or the white-glove services we offer our customers, don’t hesitate to contact us or visit our showroom today to find out more!